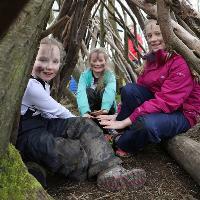 Join us to build a Den Village in the Woodland. Take part in some games and challenges to win extra materials for your den and let your imagination run wild! Advanced booking required. Wild Families Activities are VERY popular and sell out fast, so we advise you to book your ticket early! Please come dressed for the weather wearing sturdy footwear. This is an outdoor activity. Early bird tickets are onsale online until 11.45pm 1 week before the event. Standard online ticket sales end at 11.45pm the day before the event (subject to availability). On the day tickets are subject to availability and are subject to +£1.00 charge per ticket or £2.00 for a Family Ticket.